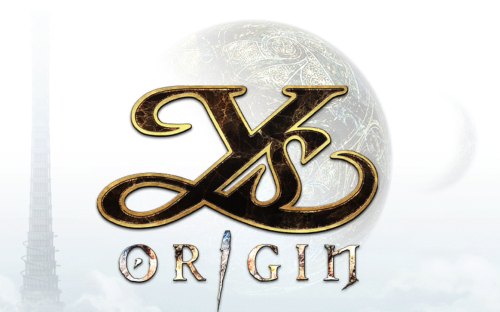 Ys Origin calls itself an RPG, and is in the RPG section of Steam, but it really plays like an action platformer: There is very little roleplay, and a lot of platforming and action. There are three different playable heroes, two of them melee and one ranged. With your hero, you search a tower, floor by floor, looking for your missing goddesses. 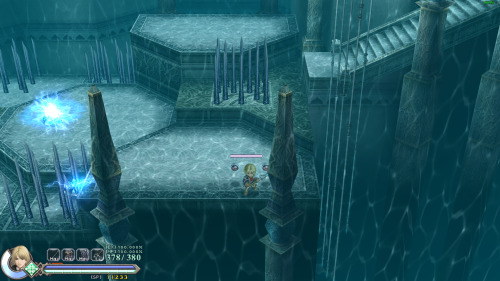 These floors have different environments, from dungeons, lava zones, sand traps, “purple evil” zones, and (somehow) an underwater level halfway up the tower. There are 25 odd floors in total, each with many areas to explore, simple puzzles to solve, and hordes upon hordes of monsters to slay. The monsters are quite varied, come with their own skills and spells, and will kill you quickly if you are not careful. 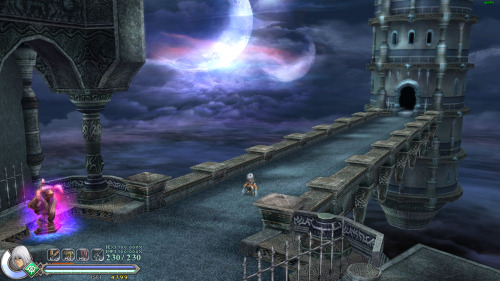 Most of the gameplay is in the form of fighting these monsters, though you do spend a considerable amount of time jumping from platform to platform and navigating the areas. Every couple of floors, there is a boss fight, and these boss fights are both spectacular and difficult, easily running you over and crushing your gamer pride, until you learn the boss pattern and win. 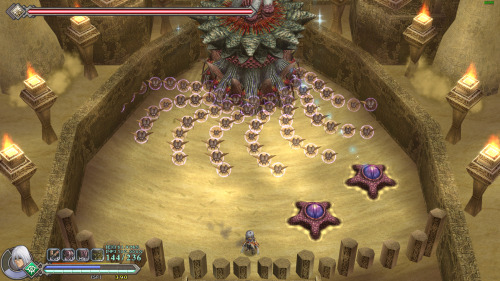 Defeating these bosses after several retries (in some cases giving up and trying again the next day) proved to be the most satisfying part of the game. The game has decent replay value, as you are able to play the game with 3 different heroes (and get to see their different viewpoint of the story). A complete playthrough using one hero is about 10-12 hours if you are playing on normal difficulty and trying to get all the achievements, or about 6-7 hours if you know what you are doing. Thus, you are looking at some 30 hours of gaming for all 3 heroes, and that is without including the bonus modes and harder difficulties, which you may or may not want to play. This reviewer played the game three times, once on easy, and twice on normal difficulty. Gameplay flaws do exist, though. You often get “stuck” in a floor, where a barrier of some sort impedes your progress. Some item somewhere in the level is needed to remove this barrier, and you need to go around looking for it. This sometimes involves a delicate puzzle or some intricate platforming action, but may also be a silly chore like blowing out or lighting some scattered fires. It feels like the designers purposefully added extra chores to force you to backtrack a bit through certain areas. Another flaw is very apparent after you fight a few bosses: The game can be won through skill, or through grinding. If any boss proves to be too much of a challenge, then you can just go back a little and grind some monsters for an extra level or two, then retry the boss. It would have been better if the bosses were more level independent, as grinding and winning over a previously-difficult boss feels a bit like cheating. A “flaw” that is not really related to in-game gameplay but more to “wrong label” is that the game is not a true RPG: The game is mostly hack-and-slash, with only a few RPG elements. You do gain experience, level up, and get tougher, but you do not get any choice in what aspects of your hero to level, and you are limited to a total of 3 skills only. Keep that in mind if you are buying this game with the expectation of a proper RPG, as it is an “action RPG” with heavy emphasis on the “action” part. This “wrong label” is a minor issue that we note for the benefit of the reader, and did not affect the score. Overall, the gameplay is fast, hard, and a thoroughly enjoyable experience, particularly the boss battles. For an 8-year-old game, the gameplay is as fresh as ever. The biggest negative issue of the game is the outdated graphics, which feel like something you would find in a Playstation 2 title. It is true that the game was released in December 2006, so it is roughly 8 years old at the time of this review, but unfortunately we do not make allowances for age, and we review all games with a modern (2015) eye. 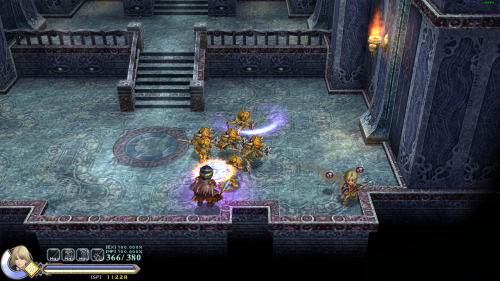 The game’s textures are grainy, blurry, low-resolution affairs. The characters are hand-drawn instead of being proper 3D, and this makes them stand out against the low quality backgrounds. Many of the monsters are copy/pasted and re-coloured. The effects probably looked good on release, but to a modern gamer, they are laughable. In the prettiest areas with the best graphics, the game is just “acceptable”. 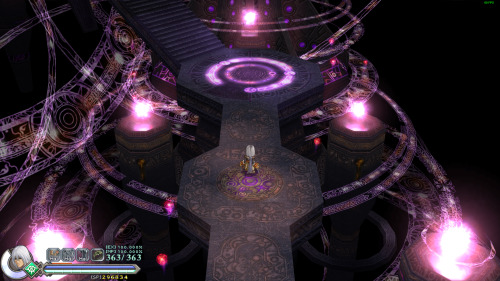 Graphics are not just about texture quality, though: In terms of design and aesthetics, the game does quite well. It might even look good on the smaller screens of a handheld device, where graphical flaws are less apparent. Unfortunately, the graphical engine that the game is built on is simply too old for a modern PC, and good aesthetics can only do so much. In all honesty, if you are the type of person who prefers good looking games, give this one a miss. – As Yunica, an apprentice knight. She is naive and inexperienced, but friendly and likeable. She starts out as a weak fledgling knight who is unsure of her capabilities, but grows stronger and more confident, until she surpasses everyone else around her. – As Hugo, an intelligent magician who is haughty, insensitive, rude, arrogant, and a proper jerk. He has his own reasons to desire power, and he is willing to be demonically corrupted in order to achieve his goals. He redeems himself by the end of the game, though. 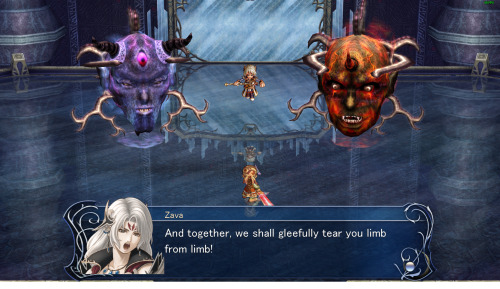 – Or as The Claw, a character you unlock after beating the game with Yunica or Hugo. The Claw is a conflicted soul seeking salvation, but his path is difficult and morally ambiguous. In order to keep spoilers to a minimum, we will not get into The Claw’s point of view, but we will say that it is the best of the three. Regardless of who you play as, you are required to search the tower for the missing/hiding goddesses. While the playable characters are quite well written, the majority of the cast is not very interesting, the story behind most of the bosses is a bit dull. An hour or two into the game, you will have met most of the characters, and you will find that most of them are quite cliche. Many of the unplayable characters of your party are badly written placeholders, without any emotion or impact on the game. They are only there in order to have a different face once in a while when you read a dialogue. Other than that, they can be described with a word or two: Miuscha is a wimp. 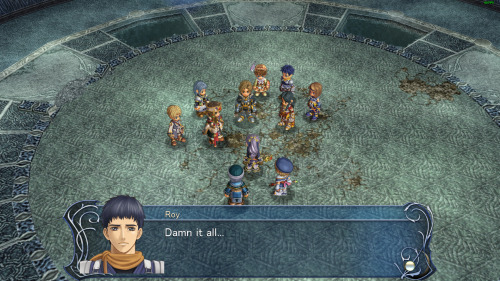 Roy is a nice boy. Shion is a cardboard cutout. 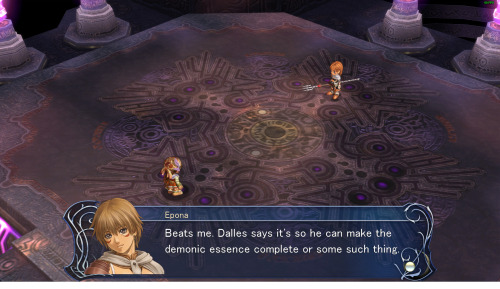 Dino, Eolia, and Ramona do not do much other than “simply exist”, having a few lines each throughout the entire game, and could have easily been written out of the story. The antagonists are hardly better, with Kishgal (and Dalles too, to a certain extent) being one-dimensional and bland. Their dialogue is a variation of “Haha! I am bad. I will kill you now. Prepared to die!” A lot of bosses do not even have a story, as you just stumble upon them and start fighting, or a boss summons them and you start fighting. Epona and Zava are the exception, both having personalities that you can appreciate. Without spoiling too much, the story is weak. The goddesses who are missing/hiding have a weak reason for doing so. The bad guys want to catch these two goddesses in order to take their power and become even more evil. 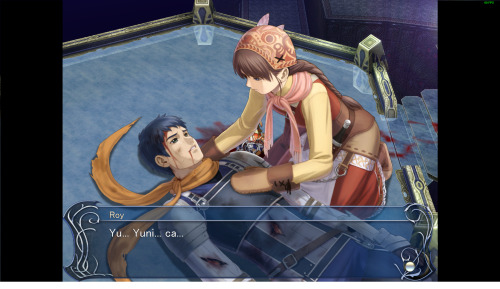 If you have watched any Saturday morning cartoon with an evil villain trying to take over the world, then you can skip the story of Ys Origin. It is not a terribly written story, but the game is definitely not something to buy for the plot. 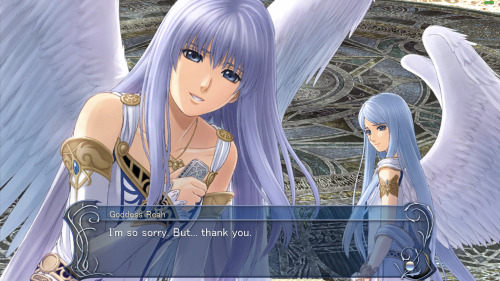 Music is difficult to describe with words, so let us be direct: Ys Origin has some amazing music! This reviewer particularly enjoyed the soundtrack that played in the Flooded Prison, the Silent Sands, and the Demonic Core. The game’s graphics may not have aged well, but the music remains fantastic. Listen to the main theme, and let us know in the comments if you know of a game theme that is as good. 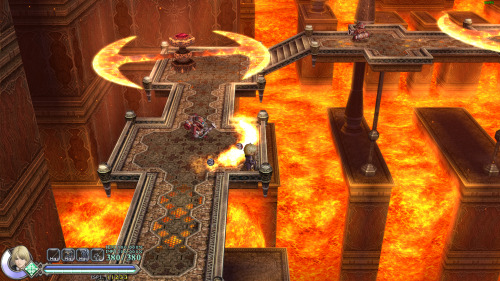 Ys Origin is a fast paced action platformer with good gameplay, spectacular boss battles, and great music. Those who want good graphics or a strong storyline are advised to skip this one.